I was walking along the beach front at Brighton, UK the other day (Easter 2010). The Sun was out, it was a weekend and everyone was promenading along the front. 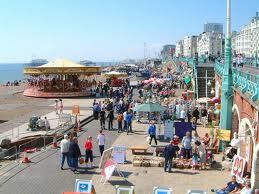 The front at Brighton was build by the Royals and is a very wide boulevard of paths and walkways with lots of café’s and stalls. It had been a long winter and suddenly there was a very definite hint of blue skies and warmth, so the English were going mad! Desperate for it. Lots of kids on their skates and skateboards doing tricks, people stripped off and laying in the sun (and it was only 14 degrees! ), almost everyone looking happy and laughing. I was walking along with my kids and suddenly I started to notice how expanded I felt. Like I was much bigger than my physical body. At the same time I became aware of the sound of drumming coming from an African guy playing his drum at the side of the walkway fifty yards in front of me. As I walked closer the sound of the drumming started to feel like it was reverberating inside me, inside my head and through my organs and muscles, and as I got closer it felt like it went deeper and started to move the fluids in me. At first some of the fluids then eventually all my fluids where rippling to the sound, creating patterns in synchrony to the rich and penetrating rhythms of the drum and as I got right in front of the drummer I saw he was a young African guy. I was entranced watching him and being suffused by the primal nature of the sound that is so typical of African drums. I noticed how at one with his drum he looked and how bright his eyes were and how animated he was. It was if he was high, and so was I. It was intoxicating, especially being so close to the source and I suddenly felt like he was drumming me, that the skin of his drum was the membranes of my body. I stood there transfixed and in an altered state and suddenly my system went a step further and he was drumming my cell membranes. Wow, what an experience that was. It was like every cell in me was getting massaged by sound waves. I realized I was the only person listening to him, everyone else was walking by in their own worlds. It was amazing that only the drummer and I were experiencing this. I realized too that he was experiencing the same feelings as me, perhaps he wouldn’t have named it in the same way, but organically it was the same things. And just for a moment I understood African drumming, dancing and the trance state and how primal it was. Unfortunately my kids suddenly arrived on their scooters demanding that I walk on and watch the skateboarders do their jumps further along the front. I could feel my resistance to leaving and also wondered if I would be able to walk ok as I felt inebriated by now. As I walked away I looked around and felt the amazing juxtaposition of the sea, the horizon, the sun and the drumming all somehow entwining together to produce an ecstatic relationship. I hadn’t seen the connection of them all before then. As I write it now, the affects of the experience still resonate through my cells. The mere memory restimulates it. Anyway here’s an audio file of some African drumming. Try thinking of the horizon and see what happens. Also I’ve added an audio file of some Indian tabla music which produces very similar states. can just imagine you walking on the aristocratic Brighton boulevard on a sunny day hearing this great african drummer (and the children pushing you friendly farther…). this situation sounds familiar to me, with the difference that my children are almost grown ups now and – that i have to move, cant sit or stand still when i hear music and especially this very energizing african drums. they dont create waves in me, they create orcans in me. so i started dancing when listening to your post, and suddenly my cat reacts also to this, she starts running and jumping around and looking very funny , with wild eyes at me. then i listened to this great performance of the indian drummer and i feel that i move complete different and calm down, so does my cat luna, she sleeps now(?). probably we feel the same waves (or she has mirror neurons too???) and its obviously that the african drums touch our souls more powerful and different than the indian drummer. once i lived for a while in Senegal in a loam hut, sleeping on a mattress on the floor. had a great time and some day a strange experience, got so sick that i thought im going to die, but crazy, wouldnt have mined, felt as if i would melt togehter very smooth with the earth, just like on your picture with the horizon, when the sea melts together with the sky – melting from one world into another – must be beautyful! since this time in africa and this particular experience i have a different view at dying and death and probably at the whole life. wow that drumming is almost paralizing and my system felt incredibly potent from that sound….. was like standing inside my own heart.